Cape Cod is magical at any time of year. However, many permanent residents, including sisters Rachel and Beth Brewster, find it hard to make ends meet during the cold, lonely winter months, which is why they must work extra-long hours at multiple jobs all through the short summer season to save enough for the rest of the year. To complicate matters, Beth is only fifteen and is restricted as to how many hours she can work during the school year. It wouldn&apos;t be so bad if their mother weren&apos;t an alcoholic who absolutely refuses to help with the bills. 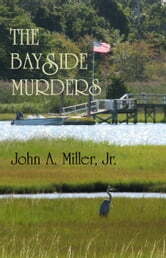 Then the dead bodies begin cropping up in the neighborhoods and marshes surrounding scenic Lewis Bay. The Yarmouth and Barnstable Police begin to see a pattern linking both Rachel and Beth to the murders, but they can&apos;t seem to assemble enough proof to make an arrest. Meanwhile, a regular patron of a bar where Rachel frequently works in the evening provides some help in the young woman&apos;s search for a better-paying job, and life becomes hell for Beth as she is stalked by several teenage boys who have their own ideas about what constitutes a loving relationship. More By John A. Miller, Jr.